Hemp is of first necessity to the walth and protection of the country. Columbus's discovery of the New World was powered by hemp sails and rigging. The original drafts of the Declaration of Independence and the Constitution were written on hemp paper. 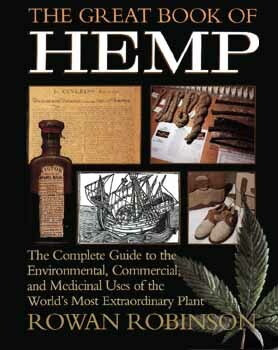 Hemp was used for money in the Americas until the early 1800s. Hemp fiber has been discovered in tombs dating from 8000 B.C.E. The United States government encouraged farmers to grow hemp to help win World War II. Hemp seed is nature's perfect food, packed with protein and essential fatty acids. Over 100 medicines are made from hemp. Henry Ford built and powered a car with hemp. Hemp, Cannabis sativa, has been called man's greatest plant ally. It has been worshipped as a source of spiritual enlightenment and a sustainer of human life, but until recently hemp's amazing past was virtually forgotten. Once at the foundation of civilization's economy, it was not until the twentieth century that hemp was outlawed. But hemp is back. Europe and Canada have lifted bans on growing industrial hemp and it has exploded onto the marketplace in a dazzling array of products: from jeans, sneakers, and lip balm to tree-free paper, fiberboard, and insulation. With new technology it is possible to make anything from hemp that we now make from petroleum --including paint, plastics, and biomass energy. In this illustrated, comprehensive guide, Rowan Robinson reveals hemp's hidden history. He examines hemp's role as man's first fiber crop, its role in Hinduism and other world religions, and as the catalyst of cultural revolution in the 1960s. Robinson also exposes the prejudices and cover-ups behind the marijuana hysteria of the last fifty years. Calling on contemporary studies, as well as ancient wisdom, Robinson makes an extensive analysis of the nutritional and medicianl uses of hemp and of its surprising potential to solve some of the world's most troubling environmental problems such as soil erosion, soil contamination, and deforestation. With a resource listing of companies and organizations involved in the hemp rennaissance, The Great Book of Hemp is your complete guide to the world's most extraordinary plant.